Stadium comes first, and then comes the team. Built in 2006, Emirates Stadium has turned into a legendary battlefield hosting Arsenal F.C. The stadium depicts club’s glorious history and is the home of almost 60,000 of its dedicated supporters. West Stand – the central long-side seat row. North Bank located on the north of the stadium. East Stand right opposite the West Stand with VIP seats. Clock End for away fans with their seats located in the Southeast corner of the stand. As a rule, the stadium hosts about 3 000 tickets for away supporters. However, the number can be increased in case of cup games or European matches. StubHub is a trustworthy service that has proved its flexibility and ease-of-use. Buying tickets here is a piece of cake. Use filters to choose dates and times that will suit you most. Affordable prices will certainly make your day. Upper Tier Corners prices range from £35.50 to £85.50. Lower Tier Corners prices range from £27 to £65.50. 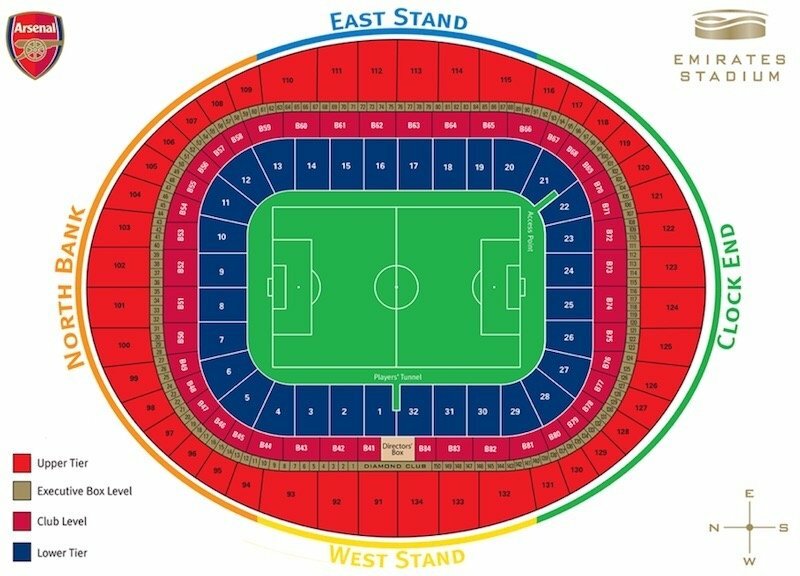 We recommend checking the actual prices on the official website of the Emirates Stadium. There you can track the current match schedule as well as choose a seat. Make sure you buy tickets in advance. As a rule, they are all sold out 2-3 months before the match. London welcomes millions of visitors each year. Some of them come to see city’s main places of interest. However, all of them vanish as soon as the matchday takes place. Booking.com is the number 1 choice for both casual visitors and football supporters. It lets you book hotels with the best location in advance. Make sure you already have a great place to stay near the stadium with just a one click away or take the advantage of our list of cheapest and highest-rated accommodation offers. Charlie Hotel – for almost a decade this venue has been welcoming guests who use Booking.com. It boasts great accommodation offer from only € 75 per night for a double room. Great location and fast access to London’s tube will let you easily get to the downtown in less than 15 minutes. The Square Camden – a good alternative to staying for the night and visit the legendary Camden Market that is a 19-minute walk from the hotel. It will also take you about 17 minutes to get to the Emirates Stadium. € 87 looks like a bargain under such circumstances. The Castle Bar – it is not a pub. The venue represents the best you can get from Bed & Breakfast hotel for only € 91. The price includes great continental breakfast in addition to a free private parking place. A good option for those who travel by car. Finsbury Serviced Apartments – pay € 112 for one night and benefit from fully serviced separate apartments. A good value for those who look for great location and some privacy. Apartments include a bathroom and a separate kitchen as well. Highbury & Islington Hub – located next to the King’s Cross Theater and a 12-minute walk from Emirates, this hotel offers a set of amazing accommodation facilities for only € 142 per night for a smart studio. Modern Studio in Great Location – this venue is the closest spot to the Arsenal arena. It will take you not more than 7 minutes to get to the stadium. The apartment consists of a studio with a pack of facilities delivered out of the box for € 363 per night. Visitors will hardly face any difficulties when getting to the stadium. London boasts one of the most comprehensive public transport systems making it easy to reach any destination using various paths. Even if you are lost, simply follow the pedestrian signs installed all around the streets. Simply use the signs and you will get to the arena effortlessly. By Tube – Holloway Road is the nearest underground station to Emirates Stadium. It is a part of the Piccadilly line and is a couple of minutes’ walk from the arena. You can also use Arsenal tube station next to the Highbury Square. By Train – overground trains will also let you easily get to the arena. You can use several routes with the King’s Cross Theater as the major station. You can reach it from any tube line. Finsbury Park is the nearest train station. It will take you several minutes to get to the stadium. Opt for Highbury & Islington if you use Victoria or North London train lines. By Bus – London boasts a comprehensive ground transport system. Bus lines connect all sides of the city and make it easy to get to is any point. Some of the major bus stops include Highbury Corner, Seven Sister Roads and Holloway Road. By Car – if you travel by car, look for the City sings (Central London). Follow the M1 highway until you reach the junction 2. Then drive along the A1 and in about 6 miles you will come across the Holloway Road Tube Station. Turn left onto the Hornsey Road and you will reach the arena after about a quarter-mile. By Plane – overall, London has six international airports. Heathrow is the largest airport accepting over 75 million passengers from different countries annually. It is about 14 miles from the city. You can use the bust to get to the downtown or to the nearest tube station. There are never enough official park spots at Emirates Stadium during the big games. However, there is always a solution. The approximate matchday paid parking price near the sports venue in London is £4. It does not matter if you are looking for a tranquil menu to discuss tactics and starting lineups before the match or want to get involved in singing after the victorious game, you can find plenty of decent-drink pubs and restaurants near the Emirates Stadium. From boozers that will warm you up to quiet spaces to have a dinner with the best selection of beers – we have them all in one place for you. The Duchess of Kent – it is certainly a hidden gem or a must-to-visit pub near the Arsenal arena. The big screens all over the venue show the main sports events featuring Sky Sports TV network. The selection of beers is overwhelming. Do not miss your chance to try Doombar and some other award-winning brews. The Gunners – the unamicable venue for every dedicated Arsenal supporter. The venue serves a variety of grilled foods and beers to warm up before the match. Underground interior, overwhelming beer garden, and BBQ make this venue a perfect place for a pre-match drink. The Twelve Pins – a classic English pub with a variety of popular beers like Guinness in addition to extended food offerings featuring legendary British fish & chips. Brewhouse & Kitchen Highbury – the venue boasts its own microbrewery and perfect location. It will take you 15 minutes to get to the stadium after a fare meal and a couple of local beers. The Tollington Arms – a nice and cozy venue serves different foods from traditional English breakfasts to Thai cuisine. It has an outdoor space to enjoy the sun that is so rare in London. The Coronet – a very quiet and pleasant space with a hospitable staff and a huge variety of burgers, steaks and other food offerings. The Emirates Stadium offers a diverse selection of amazing tours for different tastes. Whether you are looking for VIP excursions or get behind the Arsenal scenes with a group of friends, the arena has everything you need. Take the advantage of special editions like Legend Tour and meet one of the Arsenal legends live. General Stadium Tour + Museum – visitors will have a chance to feel themselves Arsenal star players and walk through the players’ entrance, get to the Director’s Box, walk down the tunnel and see the dressing rooms. The adult ticket costs £22. Children under 5 are free to visit this tour. Legends Tour – a good chance to meet one of the Arsenal legends live. They will share their experience of winning trophies, discuss the current situation and tactics, answer your questions, etc. The tour includes a complimentary entry to the museum as well. The ticket costs £40.00. VIP Experience – the amazing offer for VIP guests who will be guided by Ray Parlour or David Seaman. You will visit places that no one has ever visited or even seen. The tickets are limited. Make sure you book in advance. The museum was recently re-opened after the reconstruction in 2016. It depicts a glorious story of the football club that was established in 1886. Visitors may choose from various exciting exhibits or benefit from video theaters that display legendary highlights and moments from most iconic Arsenal wins. The museum operates 7 days a week. The price ranges from £7 (children under 16) to £10 (adults). The Armoury – the flagship store located on the West side of the arena. Open from Monday to Saturday : 9am – 6pm. Telephone: +44 207 704 4120. The Arsenal at Highbury House sells printed shirts, gifts and more. Open from Monday to Saturday: 9am – 6pm. Sunday: 10am – 4pm. Telephone: +44 207 704 4128. The Arsenal Finsbury Park offers a collection of leisure and training wear. Open from Monday to Saturday: 9am – 6pm. Sunday: 10am – 4pm. Telephone: +44 20 7704 4515. London never sleeps offering a huge selection of things to see at night or at daytime. Here you can benefit from post-card places of interest and iconic attractions in addition to underground entertainments enjoying modern arts or bringing fresh air in the wild. From the Big Ben and the Tower to a spectacular spin on the London Eye –visitors will be amazed by a diverse selection of things to see in London. It does not matter if you are an experienced Londoner or visit the city for the first time; you should start with general sightseeing tours. They are divided into several categories depending on the time and places of interest you will see. Tourist Bus Panoramic if the number 1 choice for many visitors. It costs only £21.60 and consists of two different routes visiting the Big Ben, the London’s Museum, Buckingham Palace, Downing Street and other legendary locations. The tour starts from Westminster Pier and ends at St. Katherine’s Pier. 24H and night sightseeing tours are also available. So, you can easily plan your stay in London. The London Eye – take a spin on the biggest British Wheel and be amazed by the panoramic view of the River Themes with all major places of interest. The wheel will take you on a 135-meter height to see the Big Ben and the Tower Bridge. The London Dungeons – witness the nasty and dark side of London. Follow the steps of infamous Jack the Ripper and other villains of old times like Sweeney Todd. Have no worries, those are only actors. However, they will make you shiver with fear. The Natural History Museum – the legendary museum keeps over 100 different seaborne specimens depicting animals that lived more than 50 million years ago. The exhibits highlight prehistoric creatures and things from the past. I am an arsenal fan but what are the nearest universities to the emirates stadium?? ?